Known for hosting some of the most extravagant and colorful festivals in Europe, the city of Barcelona is once again gearing up for the annual Festes de la Mercè! Referred to as the biggest street party of the year, this celebration dates all the way back to 1902, and makes for the Catalan capital’s official farewell to the summer months! The 2017 edition of La Mercè is set to start on Friday, September 22nd and will run all the way through to Monday, September 25th (a public holiday in Barcelona). Don’t miss some of the most anticipated events including the ‘human towers’ and the ‘fire run’ that take place in the city center, and are easily accessible from most Barcelona apartments. 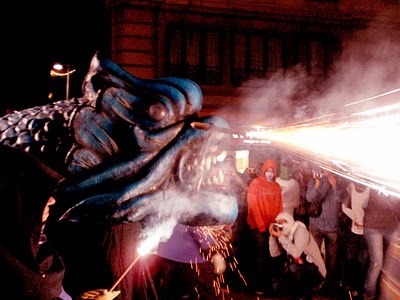 Held in honor of La Mare de Deu de la Mercè (or ‘Our Lady of Mercy’), one of the patron saints of Barcelona, this festival offers more than 600 activities and events across five days of partying – and most of them are free! From parades to music concerts and much, much more, there is something for everyone at La Mercè. Plus, this year’s festival is set to provide a massive 3-day firework competition at the Barceloneta Beach! This year the festival is expanding further afield from the traditional locations with places such as Park de la Trinitat. Reykjavik will also be the guest city of the festival this year and promises to bring their city’s best acts. There has also been talk of the new technology on show this year, which we can only wait to see. The designer and draftsman Javier Mariscal has created this years poster for La Mercè in a year that marks 25 years since the Olympic Games took place in Barcelona in 1992! 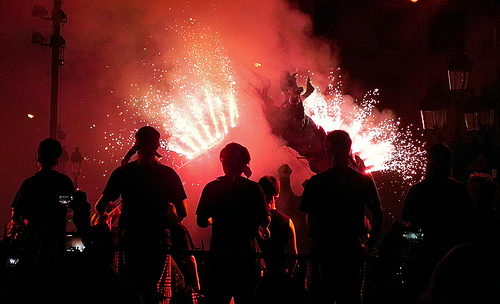 The Correfoc, also referred to as the ‘Fire Run’ is one of the most attended events during the Festes de la Mercè. Here you must prepare as dragons, devils and various fire beasts (bestiari de foc) take to the streets in this parade, where the main attraction is, of course, fire! An estimated 80, 000 fireworks are used during the Correfoc of La Mercè, but if you are visiting Barcelona with children, and are concerned that it may be too much for the young ones, don’t worry, a ‘Little Devils’ fire run is held especially for kids and usually kicks off around 18:30 on Sunday night along Via Laietana. 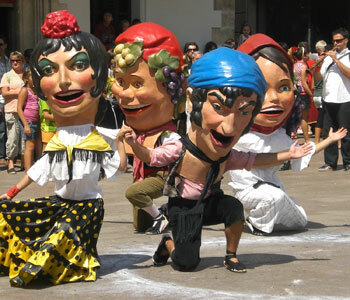 One of the most recognized elements of the La Mercè Festival is the Gegants and Capgrossos (giants and big heads) procession. This is an event to be enjoyed by the whole family, as these tall papier-mâché figures worn by ‘giant carriers’ perform dances in the streets! Be on the lookout for the Capgrossos who often run at the crowds and interact with the audience, ensuring an unforgettable Barcelona experience! 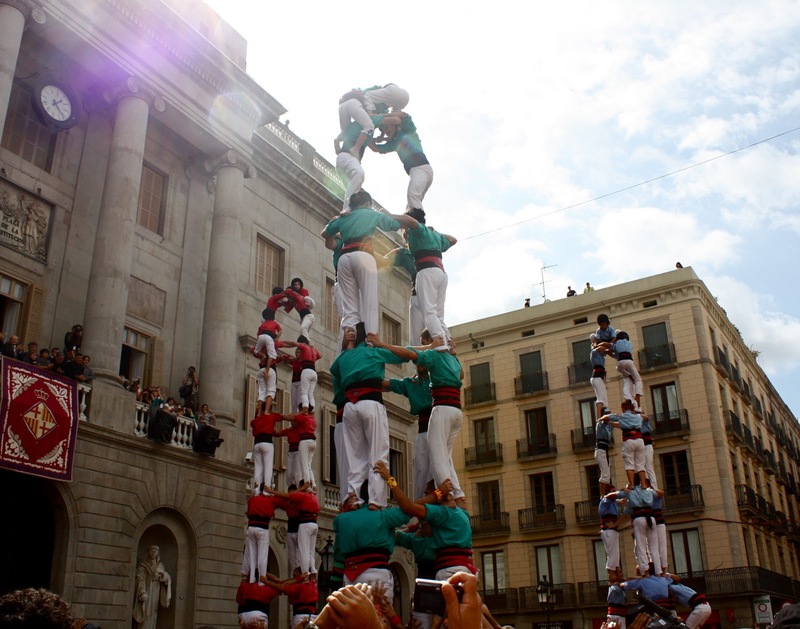 For a mesmerizing show of human strength and control, be sure to make your way to the Plaça de Sant Jaume for the Castellers! Known as ‘human towers’, you’ll be holding your breath as members of the teams climb up one another, sometimes to an astonishing height of 8 or 9 stories, finishing off the show with the smallest of the troupe climbing all the way to the top! A custom that originated in the 18th century in Tarragona, located just outside of Barcelona, it is a well-known fact that the very best Castellers come from all over Catalonia to perform at La Mercè. Definitely worth checking out! Where: Various times and locations. 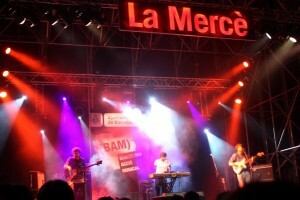 For a full schedule check out the La Mercè Official Website. 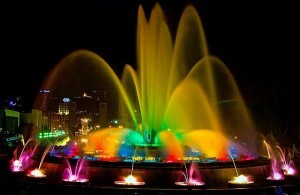 Be sure to make your way to the Montjuïc Magic Fountain for the grand finale of the Festes de la Mercè! A pyromusical display with bright lights, mesmerizing water displays and fireworks awaits you near the Plaça de Espanya at the end of all the celebrations! For a detailed breakdown of all the events during Les Festes de La Mercè, be sure to check out the official La Mercè website for regular updates. This entry was posted in Activities, Events, Home and tagged barcelona activities, barcelona celebrations, Barcelona culture, barcelona events, Barcelona festival, barcelona festivals, barcelona festivals and celebrations, barcelona tourist guide, castellers barcelona, catalan culture, catalan traditions, correfoc barcelona, fire run barcelona, human towers barcelona, la mercè festival barcelona, tourism in barcelona, travelling around barcelona, visiting barcelona. Bookmark the permalink.